I learned a harsh lesson last week. In 4th grade I had a teacher named Mr. Stanton. On the first day of school he introduced himself, talked a bit about his personal interests, then told the students he hated the color purple. For some reason, we clung to that last little morsel of information. We gave him purple balloons on his birthday, completed our assignments with purple ink, and wore the electric purple tank tops that only exist in fond tales of early ’90s fashion folklore. We weren’t antagonizing him out of spite, it was out of comfort and appreciation. Mr. Stanton was a good teacher who created an environment where we felt safe enough to retain his lessons. I have wonderful memories of Mr. Stanton’s class, and decided to use his example when I became a teacher. I told the kids that I hate pineapples. I may have made a mistake. Scratch that. I definitely made a mistake. Looking back, I realize that Mr. Stanton may have actually had great fondness for the color purple… or maybe he was specifically referencing the movie “The Color Purple.” In any case, there’s no way he would have continued this from year to year if he knew he’d be inundated with the thing he hates most. I actually do hate pineapples. I revile, despise, loathe and curse their very existence on this planet. Things like walking into my classroom to see a pineapple on my desk, or having my classroom Scentsy bar replaced with pineapple scent have become recurring real-life nightmares. Last week, former students made sure that on April Fools’ Day I received a lovely gift of a fresh pineapple, along with a can of pineapple juice. I would have thrown them away, but I wanted to avoid touching them. Leaving them in plain view was my first error. My second error was allowing my first class of the day to engage me in conversation about the devil fruit that sat upon my desktop. Bring in $70, I eat half the pineapple. Bring in $100, I eat the whole thing. Bring in $138 (25% of the school-wide goal), I wash it down with the can of pineapple juice. My hubris was my undoing. I had been so sure of their failure that what happened over the next three days will haunt me forever. My 13 vengeful 7th graders brought in nearly $150, raising far more as a class than the rest of the school combined, and I was left to honor my part of the deal. I had to eat an entire pineapple. Part of me wants to tell them that I believe they’ll never get an ‘A’ on a test ever again and see if it has the same effect, but I really don’t feel like being forced to ingest something putrid just to get them to study harder. There’s something rewarding about achieving an objective someone said you couldn’t. In fact, some people seem addicted to it. They’ll ignore a throng of encouraging voices and seek out one dissenting, doubtful voice, and use that as their motivation. Athletes. Entertainers (mostly rappers), business executives- many thrive on the idea that they accomplish what someone said they couldn’t. That’s not me, and I don’t really enjoy the idea of needing that type of crutch, but in case that describes any of you, let me do us both a favor. I doubt that any of you will get into an ivy league school. 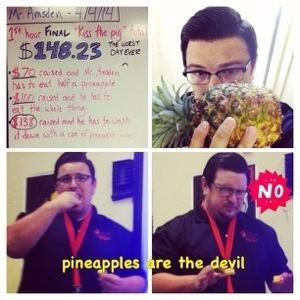 Shoot, if you get a scholarship, I’ll even eat a pineapple. Previous Post: What Is In a Name? Great story and interesting technique. I am a HS English teacher. I am going to tell students I hate marking hw. Knowing them, they would not do it and say I am doing them a favor and I should pass them. “Mostly rappers…” Really? On what are you basing this statement? Because of the bragging about stacks & watches? Never mind that sort of bragging is a direct descendant of blues & the African American culture that produced that music, but rock & country are full of folks who carry the same attitude. Look at Gene Simmons, he never misses an opportunity to tell folks that he came to America not knowing a word of English. A one James Marshall Hendrix, or Richard Penniman, or Led Zeppelin (critics HATED the band when they first came on), or any other dozens & dozens of folks. Jerry Jeff Walker, James Brown, Ray Charles, and on & on & on. Not mostly rappers. And even if that were true it would result from a system of racial & economic inequality that HAS led them to overcome more obstacles on their path to success than an individual raised in a middle-class family & community. First, thanks for reading. Even if you seemed to have missed the overall point by a comically wide margin, misjudged the context of what amounts to less than a sentence, and made the conscious choice to paint me as culturally ignorant in the comment section of a letter to my sons, it’s still nice to know people take the time to read these things. Bragging is not the topic. It was not alluded to. The bravado and flashiness that is typical of the hip hop movement can be present in the act of rebutting criticism, but has little to do with the point about how underestimation can provide motivation. What I said wasn’t an indictment of rappers, it was a recognition that the subject of underestimation, or “being hated on” is a lucrative current in this musical medium at this time. Facts are facts. Rappers address the subject of underestimation often. There’s nothing wrong with pointing out the fact that it contributes to their ability to succeed. Last, I’m not sure where you’re going with your last comment, where you basically state that “even if what I wrongly thought you were alluding to was true, it’s not their fault anyway,” but I was impressed you ended up that far off topic. Standing ovation. Thanks for doubting me. It motivated this great response. Point reaffirmed. Will you give them the responses at the same time as the letters? Here I believe deeper thought made the response more telling.